The more paylines there are on pokies, the more chances we have to win. But what happens when we scrap paylines completely? We get even more ways to win – 3125 Ways, to be precise. There are slots that have 243 ways to win, and even pokies that have 1024 ways to win. These have become increasingly popular, so much so that software developers are now releasing slots with a massive 3125 ways to win, and while there aren’t many available as of yet, just as the 243 ways to win and the 1024 ways to win slots have increased in both popularity and quantity, our guess is that 3125 ways to win slots will gradually follow. What are multiple ways to win pokies? Paylines have long been the main way to play pokies, with the first ever invented slot machine featuring just a single payline. With just one payline, players only really had one chance per spin to win, and only if they got the required number of symbols on the 3 reel machine. However, pokies advanced at both land-based venues and online, and 5-reel poker machines overtook 3 reel classics in popularity, offering more than just one payline. Players could, and can still, find 5 reel slots with paylines from as little as nine to as many as 50. But then came the first 100 payline slot, which was the Cashapillar, a slot created by Microgaming that is available at all of our recommended Microgaming casinos. This slot offers players more chances to win and software developers began to notice how popular these type of pokies were and the reasoning behind why such a large number of paylines were so popular. While it can be a bit confusing, software developers have increased the chance to win even more so by scrapping paylines completely, and therefore the creation of multiple ways to win pokies can be attributed to slots with a huge amount of paylines (due to the more chances of winning, not the paylines). The first multiple ways to win slot released online was a 243 ways to win slot called burning Desire, created by Microgaming. It, like all other 243 ways to win pokies, offers players the chance to win 243 ways by making a bet that covers all ways of winning. Here, the idea that any combination formed left to right will win, even if the combination wouldn’t on a standard payline slot machine, was born. This concept transgressed to 1024 ways to win slots which can be found on Arctic Fortune, Hot Ink, Jekyll and Hyde and more. And finally, 3125 ways to win pokies emerged following the same concept as its multiple ways to win predecessors. These kind of slots work in the same fashion as 243 ways to win pokies and 1024 ways to win pokies do, in that paylines are scrapped and you can win in ways you wouldn’t on a standard slot machine (with more chances on this version). As with all ways to win pokies, the 3125 version still has 5 reels and includes the usual Wild and Scatter symbols, and still offers bonus rounds and innovative features. The only thing different is that there are 5 x 5 x 5 x 5 x 5 = 3125 ways to win. Unfortunately, there aren’t many 3125 ways to win slots available just yet, but just as the 243 ways to win category is padding out, we can expect the same for these pokies in the future. For now, you can try a 3125 ways to win slot from one of two leading software developers. This 3125 ways to win slot has been created by Microgaming and has quite a standard dolphin theme. The slot offers 7,500,000 coins for the jackpot, despite not being a progressive, and utilises a five by five symbol layout. In order to cover all ways to win, you need to wager at least 50 coins, with players able to bet up to 500 coins. Coin sizes are limited to 0.01 up to 0.05, depending on the Microgaming casino. In order to have the chance at winning the biggest payout in the base game you need to spin stacked Wild symbols on the second and fourth reels. 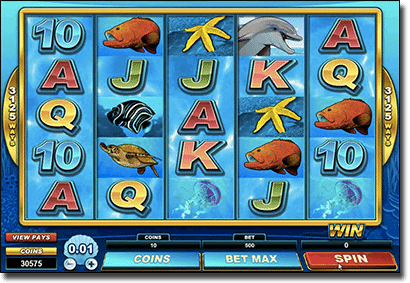 The main feature, the Wild Dolphin Bonus, is activated by the game’s logo appearing on the middle reels and here you get to choose from three dolphins to earn a multiplier from 2x to 4x. But what you really want to trigger is the free spins feature, which is activated by Scatter symbols. Spin three to land 15 free spins, four to spin 20 free spins, and five Scatter symbols to receive 25 free spins. This is where you can win the huge 7,500,000 coins as reels can be replaced and have the potential to turn Stacked. Microgaming has also included their infamous Gamble feature so you can double or quadruple your winnings by picking the colour or suit of the card, respectively. With over 3000 ways to win, Dolphin Coast is definitely a unique and entertaining pokie to try. It is important to note that Dolphin Coast is only available at the downloadable Microgaming casinos. Net Entertainment has also brought out a 3125 ways to win slot machine, called Reel Rush. Some have said this is a slot solution for Mario Brothers fans, while others have said it resembles the Candy Crush Saga game that we have all received invites to play on Facebook. Regardless, we think the slot definitely has a console game feel to it. While it features a unique format of over 3000 ways to win, it actually includes all the classic symbols some of the first invented slots had including strawberries, watermelons, lemons and more. There are 480,000 coins on offer to win and an interesting feature that kicks in every time you spin a win. Here a re-spin will occur when you have a winning combination to create more wins and the re-spins continue until you don’t create a winning combination or when you have reached a maximum of five re-spins (depending on which comes first). This is the main bonus feature and you can win quite big here. There is also a free spins bonus round which sees five Strawberry symbols activating eight free spins. While the slot is quite simplistic, the modern five by five layout makes it very intriguing. 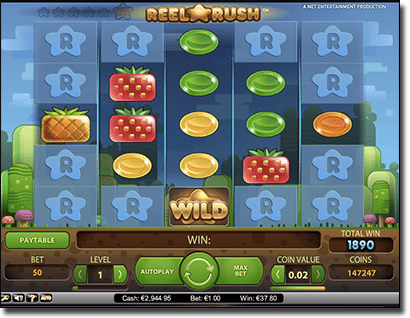 Reel Rush offers generous bonus features and is worth a try if you’re interested in ways to win pokies. There is a drawback to 3125 ways to win pokies, but whether or not it is a disadvantage to you as a player is a personal preference. Ways to wins pokies tend to see more than your average amount per spin being wagered than payline pokies, and this includes the 3125 ways to win slots. If you have a larger than normal bankroll and can afford to spend a bit more, ways to win pokies are definitely worthwhile, otherwise perhaps limit your playtime on these types of pokies. You will find one of the aforementioned 3125 ways to win pokies at one of our favourite online casinos that have been proven to payout fairly and regularly. Our recommended casinos all host high-quality, diverse online pokies from a large number of different software developers, meaning there’s a huge range of games for every type of mood and preference. Simply click on any of the online casinos listed in the table at the top of the page (which has been geo-targeted to recognise your location to filter the best choices) and redeem exclusive welcome bonuses.